alcoholic solution of propolis and flavoured with essential oils. the "scion" is then hanged at around 2 à 2,5 m high. Thanks for that. 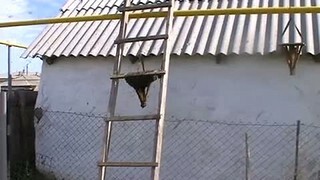 A really interesting find and perhaps a useful tool for those in residential areas who worry about swarms causing a nuisance to neighbours, if not for all of us who are not keen on climbing ladders! It could perhaps be hung from the branches of favourite swarm trees. 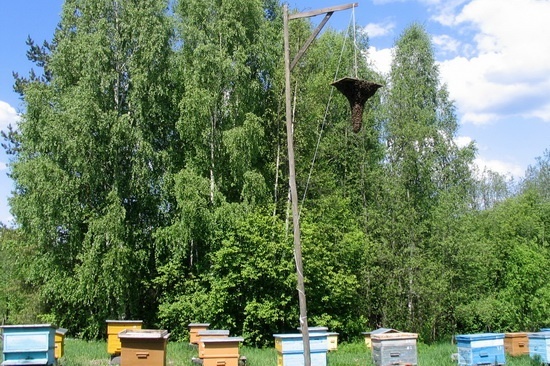 I might even just try hanging an old frame by a rope from a branch in the apiary and see if that is enough to tempt them. I guess the wood above gives them shade from the sun as well as rain. I might even try it with a piece of ply inside a down turned cardboard box, brushed with beeswax, so they have a bit more protection but open at the bottom. I have 2 cardboard boxes that I have collected numerous swarms in over the past 2 seasons and the bees find them really attractive now, so one of those would be ideal and could even be made to look pretty if you painted the outside to hang in the garden in the summer. Can you tell, I'm thinking as I write! I'm definitely inspired to give that a go. 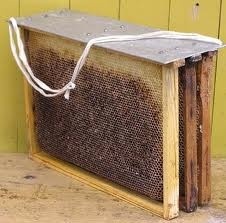 I've never seen anything like that used, nor read of anything similar to it in any of the classic beekeeping books. As a newbee I have not yet caught a swarm, plan to put out some bait hives according to the recommendations based on the research of Thomas Seeley. Thank you for posting this design, I'll give it a try in spring. 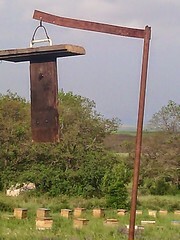 The one on the Russian website is attached to a low fencepost, does the height matter? Has anyone built one or similar yet, if so please post some fotos or are there any other 'exotic ' designs you may know of. 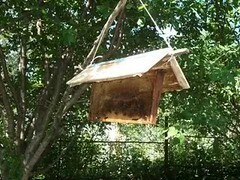 For years I kept a propolis/wax soaked burlap bag hanging in front of my hives about 8 feet off the ground. Over the years, it caught several swarms, and stayed there until it rotted away. Then when I started selling nucs about 2001 I did not replace it because my hives are split so often they don't get large enough to swarm any more. It is a good idea. Neat idea, thanks for sharing. I am going to try it next spring. It would be a very brave person indeed who would claim that this device would never catch a swarm (in your back-garden, as it were) ... but that is not it's principle purpose. Swarming is a 2-part process: the first part is where a cloud of bees issues from a hive. Now bees cannot communicate and make decisions in this form - and so the very first thing they do is to re-group as soon as possible into a cluster fairly near to the hive they've just left, and preferably at some height. This is where this 'scion' device comes into play, by providing a suitable 'collecting point' for the newly emerged swarm. To labour the point - it is intended for use in an existing apiary. The second part of the swarming event is where scouts from this cluster begin searching for a suitable site for a new home. They then report back to the cluster, and other scouts then checkout the prospective new site. When a certain threshold of enthusiasm for the new site is reached, the cluster then swarms for a second time, and is guided along the route to the new site by a chain of scout bees. 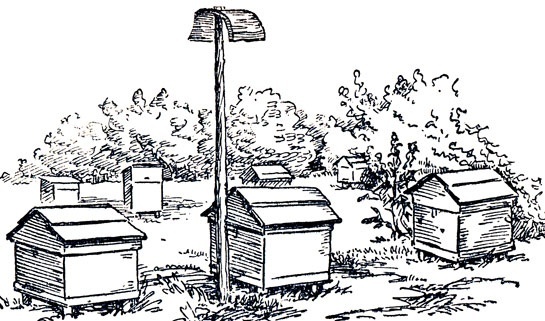 So - to catch a swarm anywhere other than in an existing apiary, it is necessary to attract the searching scout bees with a container which meets with their approval. They're actually not that fussy, and will often choose an old car tyre, upturned bucket, compost bin, cavity wall, or church steeple - their main concern being to get out of the weather. It certainly helps if the container 'smells right', as smell is one of the bees' principal senses. 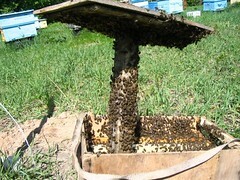 If possible, try and source some really old comb - the blacker the better, and stinking of propolis. It works like a bee magnet - for if bees have lived in that container before (that's the illusion to generate), then it must be an 'ok' place to live. If you have concerns about disease etc, simply put the comb behind some mesh to prevent direct contact. Once you have bees of course, you'll then find that swarms will start to find you - as the smell of bees attracts even more bees. a person from Reunion Island in the Indian Ocean has unearthed a (brilliant) idea from Russia, and has posted about this on a British website which has members as far afield as Canada, South America and Australia - to say nothing of the United States; right throughout Western and Eastern Europe, plus all the countries in-between. An excellent example of the power of the Internet to spread such ideas far and wide. My other thought relates more directly to bees. When bees cluster inside a beehive, they are partially supported by their comb structure - so there's nothing particularly remarkable about that perhaps - but - when they're clustered on a post (say), or on the branch of a tree, then the layer of bees which have attached themselves directly to that support will be carrying the whole weight of the cluster below them - which could run to several pounds. Ok - so that weight is being spread amongst the several hundred bees who are clinging to the post, but those bees are also providing the bees below them with points of attachment, so that the bees at or near the top of the cluster will be under significant stress - and perhaps being in that position for several days. I assume that the cluster will have some kind of 'rotating mechanism' such that those on the outside will rotate to the inside, which itself will require 'agreements' to take place amongst individual bees if the cluster is not to become detached by too many bees releasing their grip all at the same time. All-in-all, pretty impressive stuff - but because it's such an everyday (not to be taken too literally ...) event - we tend to observe such feats without a second thought. Narrow wooden ribs going from one side to the other stuck to the underside, effectively making it "corrugated". Lengths of 1cm thick rope could be stuck to the underside as ribs instead of using wooden ribs. Even better would be a criss/cross pattern of such ribs making a corrugated grid. The above would significantly increase the available surface area and so significantly reduce the load placed on any individual bee clinging to the surface. Also, a circular, convex shape to the structure, a bit like an upside down wok. This would also further serve to maximise the area to be clung to and so reduce load. Highly recommended reading for anyone interested in the total in-depth nitty-gritty on how a colony-as-superorganism makes the numerous decisions involved in the swarming process: by Thos. Seeley—Honeybee Democracy—273 pgs. ; published 2010. Sounds like you, Colin, already have a copy. I got mine from Amazon, of course. For many of us it may represent an example of Too Much Info., but taken in smallish bites, it's a good reference. I am in a totally urban area and the local bees are quite prolific in their swarming habits - no shortage of swarms. 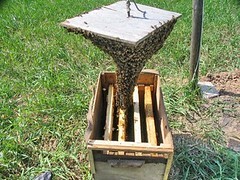 This will provide mush easier initial access in their early swarm phase. I should be able to test this within the next 30-45 days. As a development of this idea, I once read that if your swarm lure. 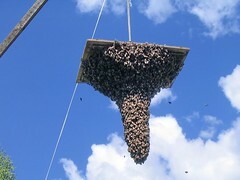 in this case a tree burr with propolis melted over it, is fixed to the underside of a bait hive suspended over the apiary, with a suitably sized hole drilled from beside the lure to the interior of the box; a swarm will often settle on the lure ,make their way up into the box and take up residence. It sounds very feasible to me. I think I read this in Bill Bielby's book "Home Honey Production", but I can't really remember. Amazing to see that the same info comes online at the same time in all languages at the same time. 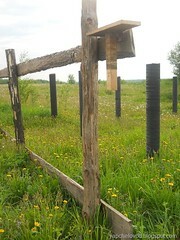 A good form of bee bob consists of a board of a size to cover the top of a brood chamber with hooks on its edges for suspension with cord from a convenient bough & having the bob proper fixed to its underside. There is nothing new in the world, just old ideas redressed. If you google 'de goede raat' you will find a link to a traditional dutch skep beekeeper who also uses a similar board. It is in the first video. I lose swarms from my garden hives most years. It seems they don't tend to hang up anywhere close by. They just come out of the hive and then straight into the woods some 500 metres away. So this year I have made my first Russian scion and its dangling in my garden. I have wrapped the underside with hessian (burlap) and coated with a mix of melted beeswax, propolis, olive oil and a few drops of lemon grass oil. If my hives swarm, 99% of the time it will be June so I am watching and waiting to see if this works for me. Missed this when first posted - will put one up this week! Very cool. Will try this next year. I tried one last year and this year. Immediate interest off bees as soon as completed. My apiary is however surrounded by numerous trees and the swarms prefer them. I may try putting a chemical lure on Scion next year, having tried molten old comb and propolis on some burlap cloth. I think it works best in an area without and trees close by. well based on this idea I made a lure not to have them land on it, but more to get them to come to the tree that it is in. well I had two swarms, out of the apple tree I had my swarm lure stick in. mabe I was just more vidulent but maybe it worked?? any how here is a video of what I did. please let me know what you guys think.. So did it work for me? NO, well not this time anyway. Up in the air at 1.00pm today circled the scion and then all landed 3 metres away on my neighbours side of the fence 2 metres up in a hedge. Prime swarm retrieved and now in a cardboard box awaiting sundown and introduction to a Warre. I am not sure they will wait until sundown before they are off again. They always seem to prefer the woods 400 metres up the road and are already bearding on the outside of the cardboard box. Having good neighbours helps a lot in these situations so I am thankful.